Do you like a Haunting Melody with Christian Words? If you do "Rise" is the perfect album for you. 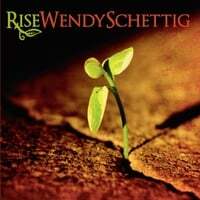 This is the Second Album from Wendy Schettig. It's an album that mixes Blues, Country, Bluegrass and Christian lyrics into one. For you musicians like myself, she finger picks her songs, you don't hear that anymore. She has a very unique voice that stays with you. The title track “Rise”, tells of growing or rising into what God wants you to be. For the artist it was a life of a singer and musician, not the nurse. God has plans for you and often times we stand in the way because of fear. Fear of the unknown, fear of failure and fear of not being good enough. "What Mercy Means" tells a story that requires mercy, grace and forgiveness. The authors personal story is one that effects lots of women today. The story of overcoming mistakes and the past. This song is born out of her struggle to accept God's mercy. There are also fun songs like "Gospel Donut" and Wolf in Sheep's Pajamas". They are are funny stories with real life application. My favorite Track though is "Somewhere Beyond this Place". It reminds me of my mission here on earth and what is waiting for me after this life. It's a song of Hope beyond our current circumstances. Jesus died so you can live....."
Wanna check it out and/or purchase the album or MP3's? Check out the band site and Concert Schedule. Like Wendy Schettig and Band on Facebook and tell her The Savings Wife sent you! You can also buy her first album, "Somewhere beyond this place"